Each Magic Planet comes bundled with a license for the Basic Software Package. It includes everything you need for your lessons. The Exhibit Package provides everything you need to select and run any of the numerous museum exhibits and movies that are available for the Magic Planet. 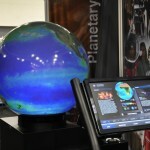 Monitor the Earth’s vital signs with NASA mission data on the Magic Planet. Explore recent data for air temperature, carbon dioxide, carbon monoxide, sea level, ozone, ice and water. Eyes on the Solar System is a 3-D environment full of real NASA mission data. Explore the cosmos on your Magic Planet. With FullGlobe, your student animators and digital artists can create high quality videos for the Magic Planet and express their true creativity on a new medium – the digital video globe. The Premium Software Package includes a suite of content creation tools, designed so teachers simply and easily can create their own content to display on the Magic Planet and tie it to their lesson. Starry Night College, by Simulation Curriculum, helps you teach a more satisfying course by making it easier for introductory astronomy students to visually grasp the concepts of astronomy using the Magic Planet. With lesson plans and activities correlated to state and national standards, Starry Night Elementary for grades K-4 is the most effective way to introduce space science with the Magic Planet. Astronomy is a big subject — Starry Night High School, by Simulation Curriculum, makes it easy to teach with a comprehensive space science curriculum solution written for teachers by teachers. Aligned to 5th through 8th grade national and state science standards, Starry Night Middle School introduces astronomy through innovative lessons that use the Magic Planet and teach the critical space science concepts for science assessments. Our comprehensive, interactive curriculum covers topics including Plate Tectonics, Earthquakes, Volcanoes, and more. Classroom and school licenses are available. The Layered Earth Meteorology, by Simulation Curriculum, gives High School and Middle School students a set of dynamic interactive simulations and learning tools. Classroom and school licenses are available.